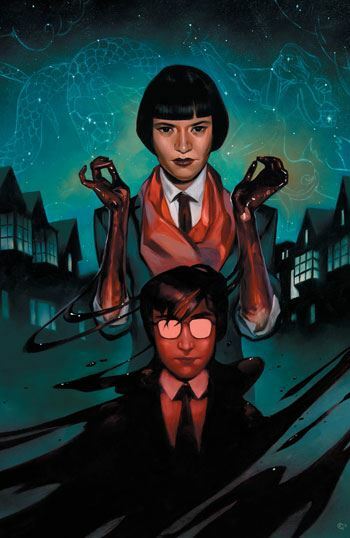 I’m really mixed about my feelings when it comes to the second issue of Books of Magic. There are a few things I really liked about this issue, but one I very much disliked. And, overall, the issue seemed a bit thin. Tim Hunter starts to learn about magic from the book he received from Rose in the last issue. I like the appearing and disappearing words. I enjoy the pages in which the book’s lettering serves as panels between the main action. And I enjoyed the interaction between Tim and his classmates, who mock him, not realizing that his magic is real. The one thing I really didn’t care for was Tim picking a magic wand, and choosing a screwdriver. This series has to avoid going too Harry Potter, and in my eyes the magic wand could have been dispensed with. Even the Books of Magic point out that there are other ways for Tim to focus his power. Yes, the screwdriver is kind of clever, and certainly not a wooden wand with a dragon’s wing inside of it. But the wands are just so important in Harry Potter. Every time Tim waves his screwdriver I am going to wind up thinking about Harry and his wand. Perhaps that was intentional. I just don’t feel it was a wise choice. Still, it’s not a game breaker for me. As I mentioned, this one seems a bit thin. Tim goes off to find his mother, and though that doesn’t lead anywhere it takes up about half the issue. I’m still a fan of the book. I just hope the next issue will be better.